There are many social injustices that are occurring throughout the Unites States and there are many attempting to stop it. “I want you to fall in love with the law…the law is an instrument” were the words that Maria D. Fernos, a lawyer of Puerto Rican background, mentioned to my class. Her message was short and simple, but its meaning was greater. She was reminding everyone present that we are all capable of defending ourselves, not with physicality, but rather with the knowledge of one’s rights. In addition to utilizing our knowledge of our human rights, we have our voice and the ability to speak up against injustices. Together with knowledge and our voices we can fight against prejudices, stereotypes, racial slurs, discrimination, the corruption, and various other injustices. Through their unique style, lyrics, and rhythms, Las Cafeteras is a band that utilizes the power of their voices to inspire, promote and speak up against all the issues that they have witnessed while growing up and that still exist in their hometown of East Los Angeles. Singing about their lives and the many aspects of it, they are able to engage and appeal to their audience. Through their audience, Las Cafeteras hopes that their message in their well-composed songs are expressed and shared to the entire world. Audiences follow those that are engaging, compel a great sense of emotion, and whom they can relate to. Las Cafeteras, since formed in 2008, have gained 3,294 followers on Twitter; 22,254 Facebook likes, and 6,058 Instagram followers. Through all their social media, Las Cafeteras keeps followers updated with images and videos and live footage of their concerts; watching them has made me a fan and without a doubt, I would attend one of their concerts. Las Cafeteras is defiant. 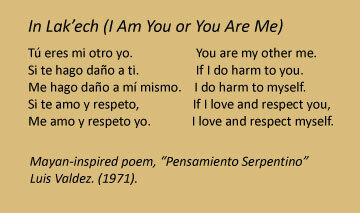 In one of their events, they decided to recite a poem called, "In Lak'ech" by Luis Valdez after Arizona's head of the department of education decided that in all Tucson's schools, students should be banned from reciting this poem. He believed that by students learning a little bit about the history of Mexico through literature that these students would then want to turn their backs on the United States government and possibly overthrow it. In addition to wanting to ban Luis Valdez’s poem, he wanted to go beyond that by getting rid of Mexico’s history from the learning agendas in school. As a response to this, Las Cafeteras announced to all of their followers that in their upcoming concert, they were going to recite Luis Valdez’s poem. This action not only displayed an act of defiance, but it also exposed to many the issues that are occurring in Arizona. Las Cafeteras are ones who promote social change through their act of defiance and in doing so gain more and more followers. By reciting In Lak’ech and through their actions, Las Cafeteras is gaining more publicity, credibility and overall gaining more followers. They are strategically using their concerts and social media as the perfect location and method to expose and highlight and bring awareness about the issues they are concerned about. Las Cafeteras, through their lyrics and the images that they post on their social media, show their attempts to build connections with their audience in a personal and emotional level. Their actions and their songs are carefully crafted, by all six members of the band, and reach audiences as well as help them stay informed and up to date on issues. Las Cafeteras uses their voice as a instrument to fight against the injustices that exist within the United States and promote multiple ways and ideas to their audience to encourage them to create change. They discuss, just like Martin Luther King Jr., that they all have dreams too: a common dream in which they see and live in a society where everyone there can co-exist with one another without the prejudice, stereotypes, and discrimination. There are many more qualities to women than being housewives and birthing children. Women have struggled throughout history in many ways to gain a voice and the ability to think freely. As social activists, Las Cafeteras has demonstrated through their social media their support of women globally, especially on International Women's day. They took it upon themselves to thank all the women that were involved in the fight to gain human rights as well as speak for those women who feel like they do not have a voice. In the name of Las Cafeteras, which is the feminine of the coffee makers, they show that all members of the band praise and value women. Having lots of and gaining even more followers, Las Cafeteras has posted many tweets about the power of women from the very beginning to the present day. Las Cafeteras reported fans' tweets as well as other organizations such as the United Nations and TEDxWELLINGTONWOMEN as seen in the images to the right. Many find it a blessing to be a woman; however, there are many individuals, more like societies, that view women as a disgraceful and unworthy. Despite the fact that these societies exist, there are many others that appreciate the women have a day dedicated for celebration. It is the women that take it upon themselves to highlight the female gender as well as speak up for more unfortunate women show these societies what a blessing it is to be a woman. Las Cafeteras shows their support of women through their music because they have dedicated an entire soundtrack to women as they celebrate international women's day. To the left is their song called "Mujer Soy" (Woman I Am) and remixed by Yukicito. Las Cafeteras focuses on a variety of social issues, both locally and globally, that exist in the world: stereotypes and prejudice, discrimination, immigration, the disappearance of individuals, gender inequality and many more. As they show their defiance against the injustices occurring in the world, they gain more followers and they gain more publicity and credibility too.